The Thermo Nanodrop 2000 is great for labs that want to function with sample analysis or preparation. It’s built for small volume sample size (0.5 µL – 2.0 µL). This uv-vis spectrophotometer is very straightforward, just arrange sample directly onto the pedestal. The Nanodrop 2000 by Thermo Scientific doesn’t need dilution, even for samples that are highly concentrated (up to 15,000 ng/ µL). The Thermo Nanodrop 2000 measures less than five seconds and comes with user friendly software with contained features. The Nanodrop 2000 is also able to measure very low or very high concentrations because of its broader range. 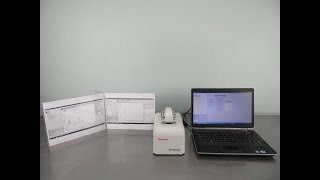 This Nanodrop spectrophotometer also has full spectral output and preconfigured methods for A260, A280, labeled DNA or Proteins, and even more. The uv spectrophotometer features toxicology assays and industrial dyes (490nm). The Thermo Scientific Nanodrop 2000 has gold nanoparticles (520nm) and Colorimetric protein assays (BCA 562nm, Bradford 595nm, Modified Lowry 650nm and Pierce 660 660nm). The slim-line, sleek design takes up very little bench space and is a must have on everyone's lab list of equipment. This instrument comes fully tested, calibrated and backed with our standard warranty. The Nanodrop 2000 comes from a very long line of trustworthy products built by an industry leader. 10 x 13 x 8 lbs. This Thermo NanoDrop 2000 Spectrophotometer is in excellent condition and comes with a clean bill of health. We ran the calibration on this spectrophotometer and it passes all of the nanodrop system diagnostics. All of our lab equipment comes backed with our standard warranty. Should you have any questions, please don't hesitate to contact us.